So we’ve got some Ginger Gold apples ready to go into your bags this week. These are an excellent fresh eating variety that mature earlier in the season than most. 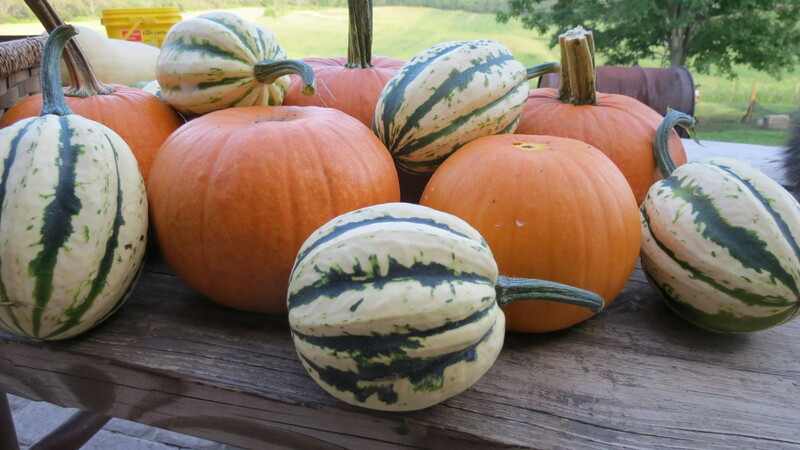 I also have some New England Pie pumpkins coming your way too, along with some wonderful pumpkin recipes everyone should try. This recipe sounds a little off, but one evening last summer, I was short on spaghetti sauce for our supper. I did have a pumpkin that needed to be used, so I improvised and this is what I came up with. My family and helpers LOVED it!!! Everyone had seconds, and I had enough for everyone, because pumpkins go a long way for a meal! In a roasting pan place onion, peppers and pumpkin face down, I add a little water to keep them from drying while roasting. Roast these veggies until the pumkin is soft, about 1 hour. In the mean time, place the remaining ingredients on the stove and simmer for the same amount of time. When all ingredients are done, mix in small batches in the food processor and puree until all ingredients are combined. Serve over spaghetti noodles or rice. We all snacked on the seeds while we waited for the spaghetti sauce to cook. This is my usual recipe, but I have added garlic powder, cinnamon or cardamon for extra flavor. Pumpkin seeds Olive oil Sea Salt On a cookie sheet place the pumpkin seeds. Drizzle with olive oil and sprinkle lightly with sea salt. Roast at 300 degrees for about 20 minutes. Here’s my relationship with pie- I love to eat it, but making it is a very different story. My mom started making pies long after I was out of the house, as my younger siblings grew more independent. The pie crust is intimidating to me, as far as time commitment goes, so I usually cheat and buy store made pie crusts- that’s my confession. I have no trouble throwing together nearly anything from scratch, but pie crust is a hurdle that I may cross one day, just not today! I will give you a recipe that makes a wonderful pie filling, but the crust is entirely up to you. If you have a favorite recipe, by all means use it. Or you can opt for the easier softer way of purchasing your favorite brand of ready made crust like I do. Blend ingredients together and pour into pie shells. I believe you will get 2 9 inch pies from this recipe, depending on the size of the pumpkin. You could also make lots of little serving pies with the filling if you like, but the baking time will be much shorter. Bake at 425 for the first 15 minutes, then turn the oven down to 350 and bake for an additional 45 minutes for a 9 inch pie, 20 minutes for a single serve pie. This is my family’s favorite in the garden right now! I usually slice the squash in half, remove the seeds and roast the squash until it is soft. Scoop out the flesh from the skin, mash it and serve like mashed potatoes. I add a little butter, milk and salt to give it a creamier, savory flavor. The boys love it, and so do I because it’s a healthier alternative to white potatoes. This recipe brings back really good memories about my grandparents, with whom I spent most of my youthful summers. I always loved it when Grandma made this for us grandchildren, I hope you enjoy it too. Just like the fried squash blossoms, you will need 3 ziplock baggies- 1 with flour, 1 with eggs, and 1 with seasoned bread crumbs. Slice your tomatoes into 1/4 inch slices. In a skillet heat up about 4-5 Tablespoons of oil, then in this order shake the tomato slices until covered in the flour, then egg, then bread crumbs. Saute about 2 minutes on each side until golden brown. Serve hot. Is it really week 14 already? Sounds fab! The Andersons would like rye flour– but fine if that doesn’t happen. I just want you to know how much we’ve been enjoying the CSA. Rye it is! I’m glad you’re enjoying everything! The flour is a fun project we just introduced this year, and it’s really working out great! I’m excited for the apples and pumpkin! My husband is excited for the apples and green tomatoes. Another great week! I can’t wait to see what you do with everything, as always I’m sure it will be fantastic! I’m sure those apples will be great in my museli brad. I have a new recipe that calls for them. I would love to start a cooking club with you. Cook one time a month. Need to be a member. Limit the number and go! What do you think? Really interesting sauce. I haven’t thought of it before but I love pumpkin raviolis.